You pull up to the front of the house with your friends, favorite beverages in hand, ready to begin a night of friends and fun. Something seems off as you make your way through the house and to the backyard. We’ve all been there, and a great party just isn’t complete without some great beats! Don’t fall victim to this kind of pitiful party scene ever again. In this review, I’ll introduce several speakers that can save you from the pain of poor-quality party sounds no matter where you’re headed. Whether you are entertaining from your own home, or bringing the party with you to another, these options have you covered. You’ll be the king of sound and boss of beats. First, let’s find out what we should be looking for. How Big Of A Party Are You Throwing? The first piece of information you’re going to need is how many people are you expecting, and how big is the room where the speakers will be located. It also makes a difference if you’re going to have the speakers indoors or outdoors. The DJ rule of thumb for sizing speakers is 5 watts per person if you are playing indoors, and 10 watts per person if your speakers are outdoors. So, if you are throwing a party and you expect around 100 people you should be buying speakers with a combined output of 20 watts. You can buy a pair of 10 watt speakers to have better coverage of the room. 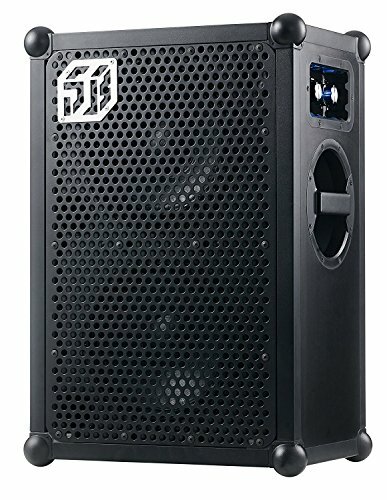 If you’re planning on throwing professional level parties where you will be having over 300 people attending you need to be buying professional speakers. This article covers the best DJ speakers and will have all the information you’ll need. 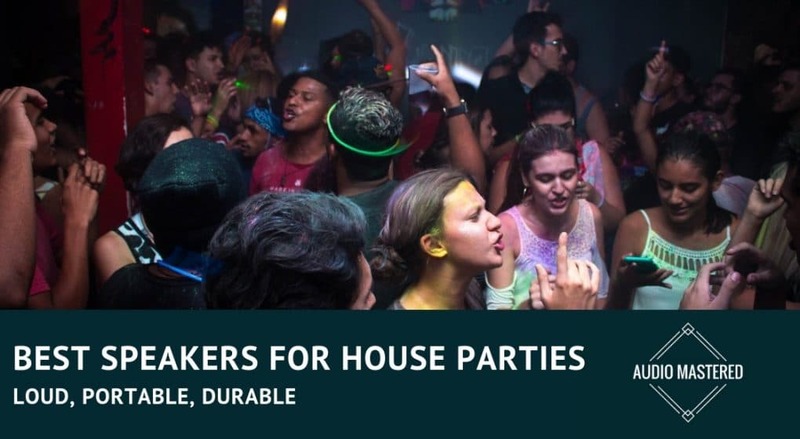 Once you’ve figured out how big of a party you’re going to be throwing you can decide what type of speaker you need. Bluetooth speakers are probably going to be the best choice for almost all of you. If you haven’t noticed how good Bluetooth speakers have become you must be living under a rock. They’re powerful, inexpensive, portable, and loud. What more could you want in a speaker? If you’re just looking for volume you can check out my article on the loudest bluetooth speakers. The speakers I’ve included on my list are almost all Bluetooth compatible just because it’s so convenient for the party setting. It’s annoying being tethered to a speaker every time you want to change the song. If you are hosting a larger party you may want to consider powered speakers. If you’re unfamiliar with powered speakers just think of the last small music gig you attended. Chances are they were using active speakers. If you are still unsure just check out this article on active speakers. I always recommend people use active speakers unless they are setting up a permanent space. Active speakers are much less complex and they can be easily transported. You also won’t run the risk of underpowering your speakers with the wrong amplifier. If you are setting up a permanent party space then you can go ahead and check out passive speakers. The benefit here is you are able to control the volume of each speaker from a single location. Our first pick is dynamite: small but packing a huge punch! The Party Rocker Plus is perfect for those who need to take the party with them. At less than 20 lbs., approximately a cubic foot square, and priced at under $200, it’s no wonder that this speaker is popular for partyers. Being able to bring your powerful speaker system with you is a huge plus, especially if you want to impress all your friends and get the party bumping! Experience good quality, powerful sound with the 6.5” woofer and wide dispersion tweeter with 50 watts of output. In addition, the Party Rocker Plus has built-in features that are sure to be a hit. First, the built-in light dome throws spins 6 different shades of vibrant colors (red, green, blue, magenta, orange, and white) to transform any location into a club in seconds. For the bold, pick up the dueling microphone and sing your heart out with professional sounding, high quality karaoke. 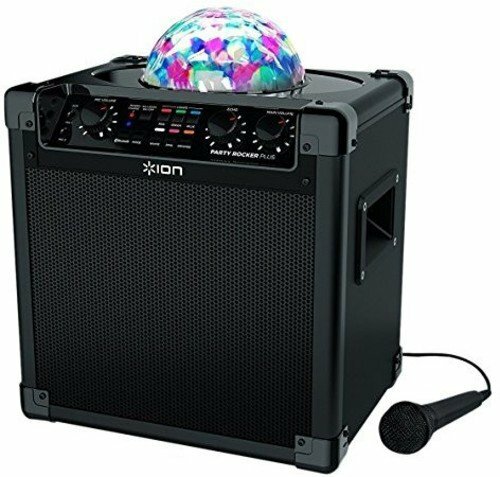 Take advantage of the Party Rocker’s built in echo effect to sing at your best and win the crowd! It can play music via Bluetooth or 3.5mm auxiliary cable input so that you can play from any of your devices. To top it off, the system runs on a long lasting and rechargeable battery for hours of powerful sound. Our next system takes the power up a notch and throws in a few more neat features at a little bit higher cost. Coming at around $350, this speaker is made to produce extra clear and strong bass. This can be difficult to find in a portable style speaker, but at under 40 lbs., you’ll be able to bring the best EDM, Hip-Hop, and fist-pumping music wherever you go. It also features ClearAudio+ capability, which is Sony’s specially developed technology that automatically adjust sound settings based on your environment to deliver the most optimized and high-quality sound to your ears. 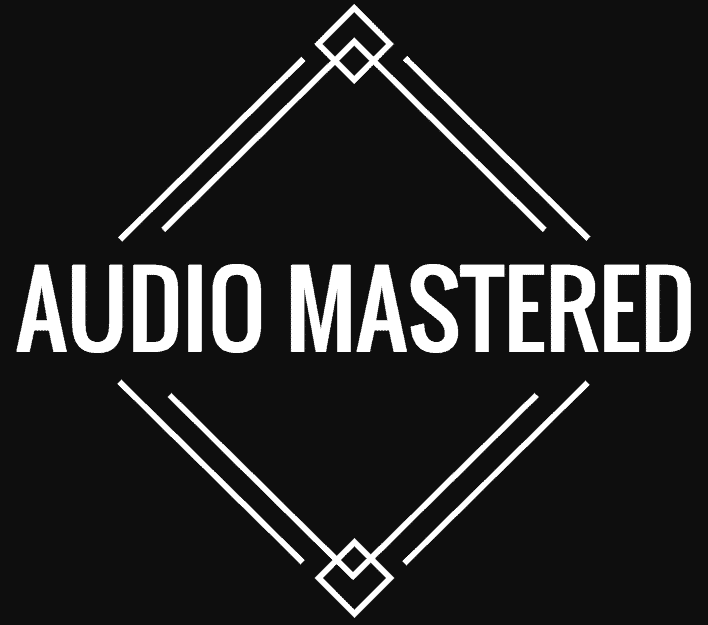 Play from old and new technology alike due to compatibility with all major audio file formats. Outfitted with Bluetooth, 3.5mm auxiliary port, USB port, and even AV connections for use with a TV or other compatible equipment, you’ll be able to play from any device. In addition, you can download the SongPal smartphone app for wireless control of the built in LED lights, DJ and EQ settings, and playlists. For larger areas or outdoor locations, you can even sync together multiple speakers for even more sound! The versatile design allows for the speaker to stand on the short side or lay down on the long side so that you can adapt to your surroundings. A built-in sensor responds to the orientation you choose and automatically adjusts the system for the best sound. Check your pocketbooks on this one, party people! Our next speaker is getting pretty serious. The SOUNDBOKS portable Bluetooth speaker brings an amazing 122 dB of top-notch sound, while still maintaining a relatively portable 33 lbs. of carrying weight. Built tough and designed to be LOUD, this system comes in at a whopping $900. A quick peak at all the goodies reveals that this price tag is for good reason. Encased in a shell of shockproof, extremely durable Baltic birch plywood and equipped with military grade batteries, you can count on this speaker to be durable and reliable in tough conditions. Taking just 4 short hours to charge, you can get up to 40 hours of play time at an average volume. Crank it all the way up and you’ll still have 8 hours of ear-blasting goodness! You can even purchase an additional removable and interchangeable battery so that you’ll never have to go without. Claiming to have the loudest capability of all portable speakers, the volume isn’t the only limit that SOUNDBOKS decided to push. Designed and built to withstand it all, this speaker makes its noise in rain or shine, desert or frozen tundra. The indoor/outdoor mode selection combined with smart automatic boost mode allows the speaker to seamlessly adjust its own power based on volume in order to optimize battery life. Like all the best speakers, it also supports Bluetooth or auxiliary cable input. WARNING! Extreme audiophiles only. The DiamondBoxx XL2 doesn’t mess around. This last pick leans heavily towards better sound quality, at the expense of its portability. While technically still portable at around 50 lbs., it isn’t the easiest option for long hauls. With a price tag of nearly $1,800, it isn’t the easiest on the budget either. Where this beauty does shine, however, is in sheer sound superiority. 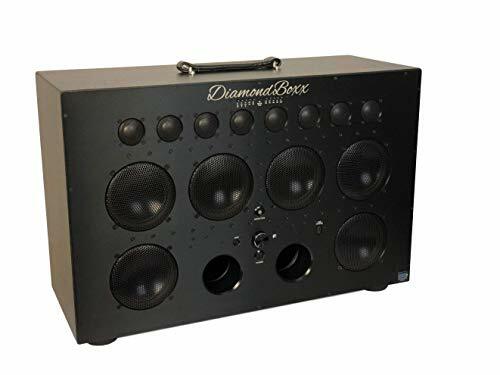 Equipped with 12 separate amplifiers and 14 speakers, the DiamondBoxx delivers the best of distortion free sound regardless of the volume. It boasts the most powerful wireless Bluetooth speaker capability anywhere with an output of 660 continuous watts and a 1,000-watt peak. Hi-fi class a/b amplifiers paired with quality neodymium motor speakers result in exceptional sound quality. To complete the package, the DiamondBoxx also delivers on all the standard expectations of great portable speakers. Connect and play wirelessly using Bluetooth or go old school with the 3.5 mm auxiliary connection. You can also utilize the TRS jacks to easily link multiple speakers and control the volume from a single location. Connect and play wirelessly using Bluetooth or go old school with the 3.5 mm auxiliary connection. You can also utilize the TRS jacks to easily link multiple speakers and control volume of all from one location. The 50-hour battery life will ensure that this speaker outlasts any party you throw and can even recharge from completely dead to full in just 6 hours. Manufactured in the USA with only the highest quality materials, there were no corners cut in bringing this beast to life. Picking the right speaker for your needs comes down to a couple of major factors. First, you will need to gauge how many people you are going to be entertaining and then you can decide on the type of speaker. While sound quality is important, volume and durability should be considered first. The last thing you want to happen is to spend $500 on a speaker only to have someone spill their beer and fry it. 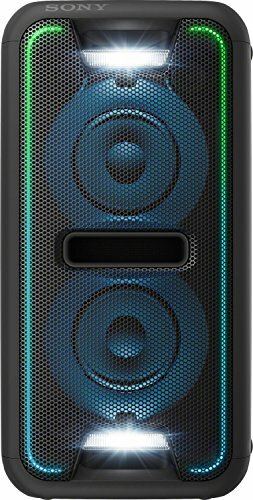 The SOUNDBOKS speaker is going to be the choice for most people looking for a party speaker. It’s loud, durable, and packs surprisingly good quality sound for a reasonable price.